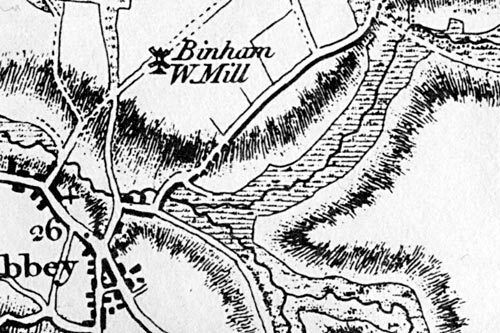 Binham post mill was being used during the 1700s but appears to have disappeared some time around the turn of that century. A 1738 engraving in Binham church by S. & N. Buck shows a postmill to the north of Binham Priory. Assignment of interest in lease Richard Walker to John Whesley 26th August 1756. Lease 17 Jan 1753 Edward Paston of Oxnead Esq to Richard Walker & others the site of the manor of Binham with appertenunces including preacourses (?) & mills & the rectory of Binham. & also a Windmill & 2 aces of Land which is let to a good Tenant at £5 a Year upon Lease. For further Particulars enquire of Mr. Nathaniel Cowper at Walsingham in the said County. All to son, Israel, "Provided always that he takes care to keep Sarah, my beloved Wife in the Dwelling where he dwells ..."
KILLED BY LIGHTNING. During the height of a thunderstorm on Saturday afternoon, Mr. Frederick Alexander Buttram, Miller of Binham, late of Thornage, having sought shelter under a tree in Church lane, was struck by lightning, and death appears to have been instantaneous. The body was removed to the White Horse inn to await the inquest. Mr. Buttream, who was widely known in this neighbourhood, leaves a widow and four young children. Death. 6th June - Binham, Frederick Alexander Buttram, aged 49.